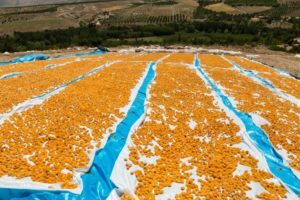 Average export price for whole apricots for October was $2695 ton FOB compared to $2924 average for 2017 crop. Export figures were in line with expectations. Prices are still lower than last year, and crop size and characteristics are the same as last year, and exports are running very much in line with last year. Prices reflect the weaker Lira earlier in the season when many contracts were booked. Subsequently the Lira has continued to strengthen, and is now trading at 5.44 to the $, a gain of 10% over the month and over 20% since the lows during the summer when much of the fruit was contracted. Packers who did not cover both their fruit and their currency in August are now facing big losses. Some contracts are being delayed. The banks continue to restrict access to credit, or are making it very expensive, interest rates for Lira loans are over 30% whereas $ based export credits cost between 9 and 14% depending on the bank. There are a number of packers who are now forced to look to growers to finance their raw materials, always a ominous sign. The strengthening Lira, mainly attributed to improving international relationships particularly with the USA, may take some of the pressure off the banks balance sheets and allow them to refinance their foreign currency loans, but inflation is still rising and reached 25% in October, so the crisis is not over yet, and the risk of renewed pressure on the Lira is significant. Growers have now sold the majority of their fruit, those who have not in the main will hang on to it until bloom. Prices of quality fruit, in particular large fruit continue to increase both in Lira terms and in $ terms. A differential of $2000 per ton between size 1 and size 4 has developed.